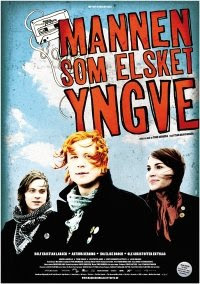 Mannen Som Elsket Yngve (2008) is directed by Stian Kristiansen, based on the novel by Tore Renberg. It tells the story of Jarle Klepp (Rolf Kristian Larsen), a red hair Norwegian teen who was forming a band with his friends. The era was the time of the falling of the Berlin Wall. Everything was fine - music, girlfriend and all, until a new boy, Yngve Lima (Ole Christoffer Ertvåg) stepped into his class. Jarle found himself constantly thinking of Yngve. After being exposed to gay love stories from USA, UK, Japan and France so often, I was happy to find an offering from Norway. The film was pretty interesting, and the story was believable... except it was until the ending part. When Yngve played, in a party, a sentimental song recorded for him by Jarle, Jarle was embarrassed. In an attempt to save his own grace of being labeled as a homo, Jarle confessed in a whisper that he loved Yngve. And Yngve ditto-ed in a whisper too. What progressed should have been a moment of beautiful confrontation. Instead, the story line turned weird where without any notice, Jarle called Yngve a homo and Yngve ran off. I could not buy that. All these could not have happened within a minute. Such a pity. It could have been my favourite new film. Mannen Som Elsket Yngve won the Amanda Awards in Norway (2008) Best Film, Best Best Children's or Youth Film, Best Direction and Best Editing. Did Yngve died at the end? I don't have a clue. Maybe the hospital that Yngve is shown at the end is a symbolic heaven. What do you think? ...well, anything may occur in a second, minute, or in any dimension, if we think over the scene mentioned, we can say yes it is real, as you labelled the movie as ''real'', and that perception of yours is bred by both the movie's and your sincerity, thank you very much.